The dolphin hunt raged on last weekend, as Sea Shepherd's Cove Guardians documented hunters capturing four Pacific white-sided dolphins for marine parks. 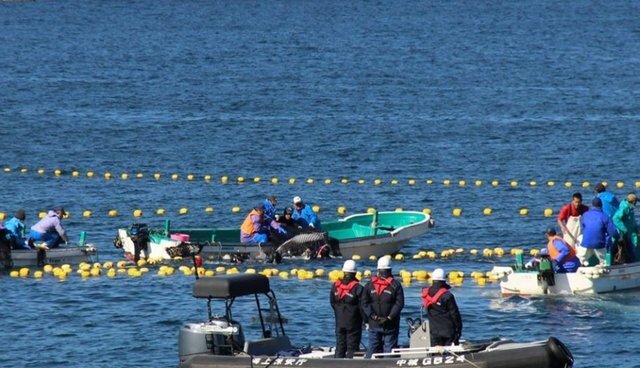 The animals, which are a valuable species for captivity, were caught near the mouth of Taiji's harbor using a net and transferred to harbor pens near the shore. For the first time, local coast guard was on hand to assist the hunters and attempt to block activists' view of the scene, Sea Shepherd's Cove Guardians report. At the same time, the sale of dolphins captured in the Taiji drive hunt for marine park display (via brokers such as the Taiji Whale Museum) appears to be a steadily growing profit source for the hunts. From 2000-2005, an average of 56 live dolphins annually were sold for captive display. From 2006-2012, the annual average has more than doubled to 137, with a total of 247 sold for captive display in 2012-2013, according to marine mammal advocacy groups. Humans began keeping dolphins in captivity in the late 1800s, and drive hunting only began in 1969, when skiffs became powerful enough to herd dozens of dolphins into the cove at once. The news comes just days after two captive bottlenose dolphins that were rounded up during previous hunts this year were found dead in their pens on Taiji's shores.